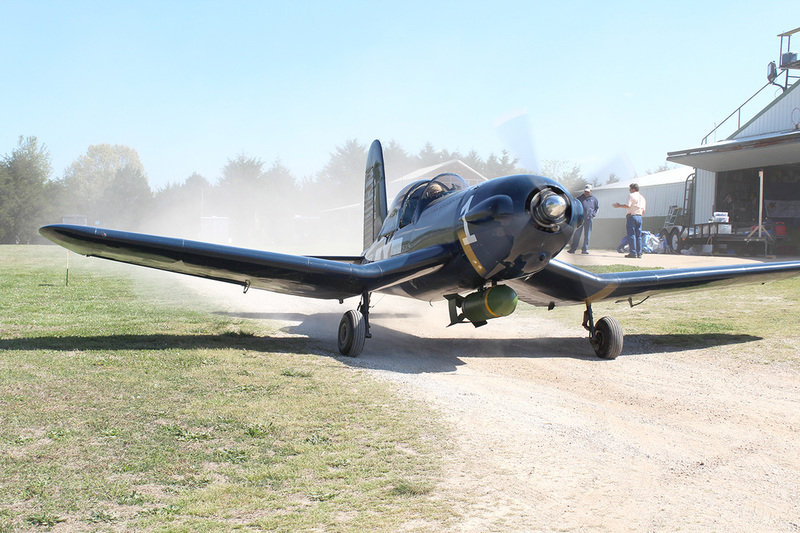 Pilot Dennis Robinson takes off in a hand-built blue Marine-dedicated plane constructed by himself and Leo Newman. Every symbol and number has symbolic or historical significance. 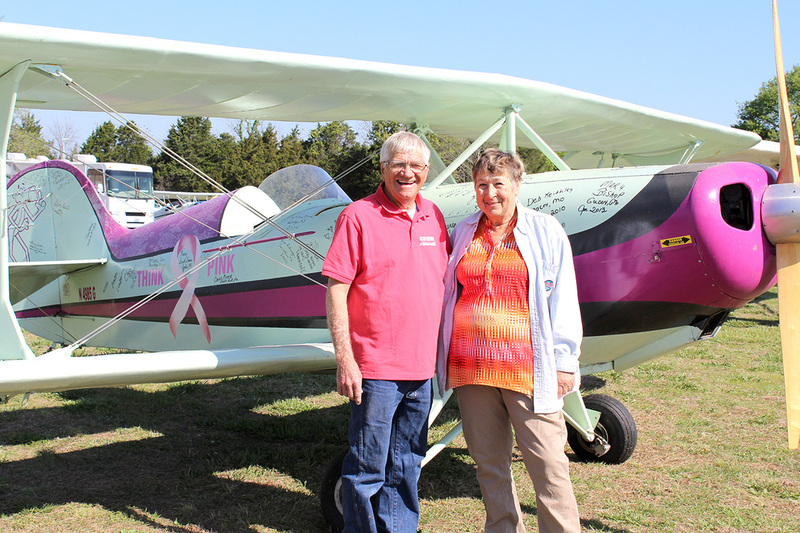 Dan and Bernice Smith have a Sky Bolt plane dedicated to breast cancer survivors. All over the plane are signatures of breast cancer survivors. 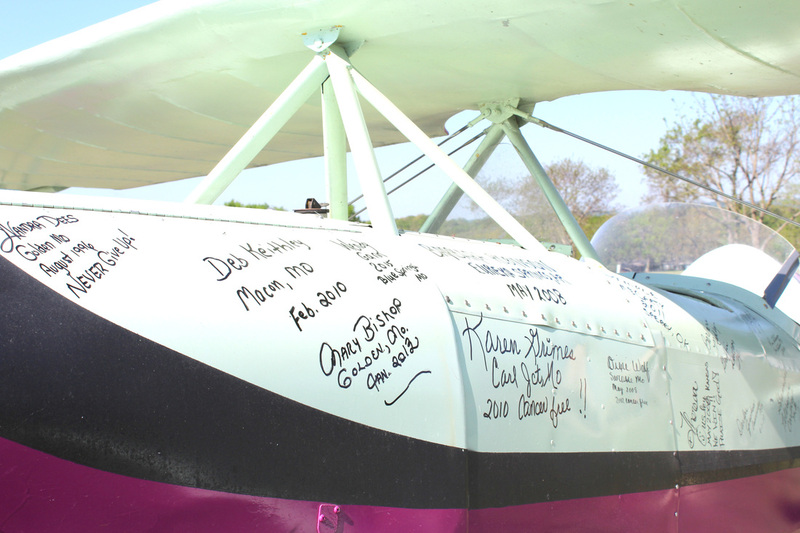 Breast cancer survivors have signed all over the Smiths’ Sky Bolt in honor of their victories. The fifth annual Golden Aerodrome Flying Circus was held this weekend, April 22 through 24, at the Golden air park. People came from all over to enjoy this annual event that has grown over the years to include many different events for people of all ages and interests. Vibrant aircrafts that ranged from mass production to homemade in the owners’ own garages flew the sun skies over Golden’s Table Rock Airpark MO32. The event began as a much smaller endeavor five years ago and has since become a much bigger affair. Dan and Bernice Smith, of Golden, stated the event as a way to host a fly-in locally so that pilots and aviation enthusiasts could enjoy the event without having to spend as much on the rising costs of fuel. Tim Serall AKA D.B. Cooper, of Rogers, Ark., stated, “We need something local that would be a fun family event.” The flying circus is just that. Each year, the fly in features food and live music as well as an airplane parade, jet demo, awards and more. There are even special drops for kids where pilots fly over and drop stuffed animals and candy from their planes for the children to rush the runway to collect. Arkansas Helicopters also provided flights for a small fee over the weekend. Pilots and enthusiasts fly in, drive in, or stumble in to set up campsite or park an RV and spend the weekend enjoying the company of other pilots and families. The event has turned into an enriching family-oriented event that promotes the fun of flying and a warm sense of community all in one place. For pilots, education classes were also a plus, teaching some skills that help them to develop skills they’ll use on their own planes. This year’s proceeds from the event went to help fund scholarships for people interested in pursuing aviation. All funds raised were donated to the Aircraft Electronics Association for educational aviation scholarships. For information about future Golden fly-ins, go to www.goldenaerodrome.com.